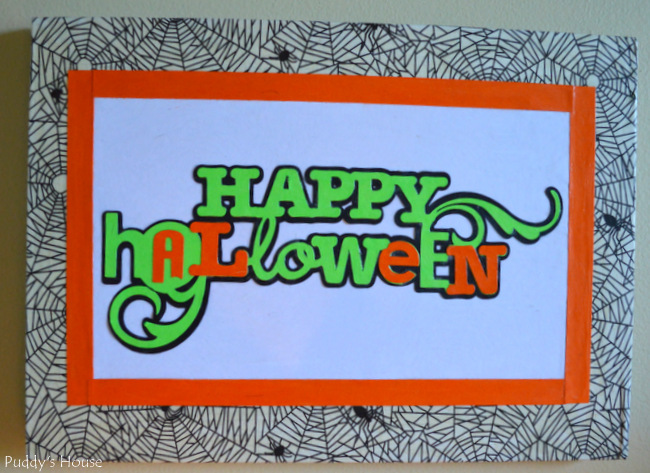 I’m not sure that I ever made any Halloween décor. 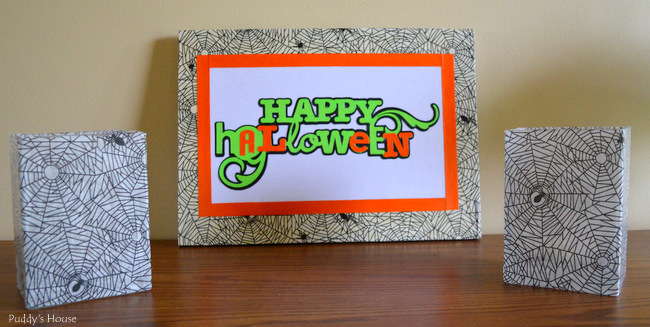 I’m not a huge Halloween decorator…I prefer just to have Fall décor to be able to keep it out longer. 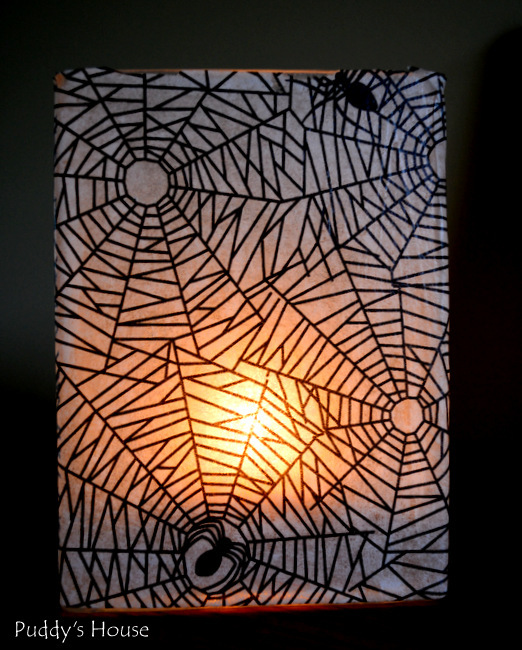 But, this summer when I found some spider web decoupage paper at a yard sale, I knew I was going to use it for Halloween decorating. The paper was only 50 cents at a yard sale. I also had these 2 rectangular vases that I got at a yard sale too…I’m not sure exactly what I paid for them, but I’m sure it was no more than $1 each, possibly only 50 cents each. This wasn’t my original intention for the vases, I tried to attached faux leaves to them using the Mod Podge and quickly realized on the first one that it wasn’t going to turn out like I thought. I did learn that dried Mod Podge can be easily removed from glass using a brillo pad and some water. The vase was good as new to use for this project. I had the Mod Podge in my supplies. 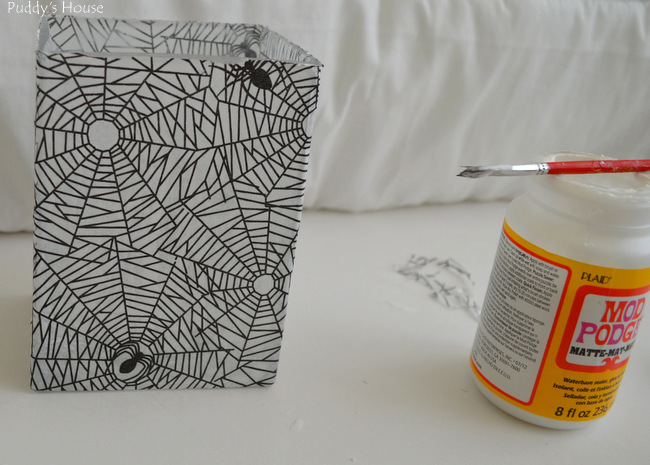 For the decoupage paper, I decided to use the traditional black and white spider webs. I cut it to the height of my vases and then wrapped it around all four sides to get the right width. I painted the Mod Podge onto the vase, one side at a time. This was so quick and easy. I was done both in a matter of minutes. 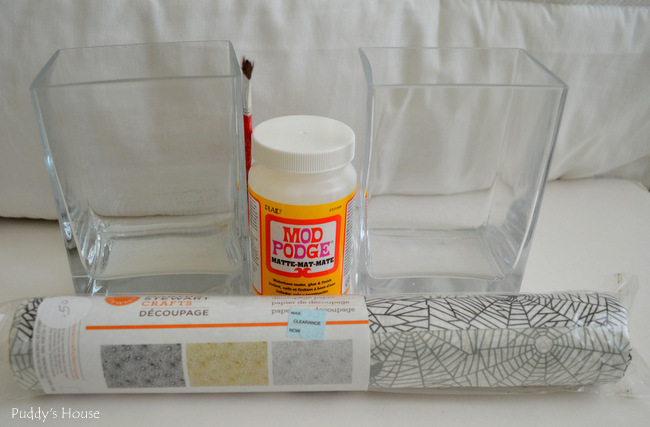 Once both vases were wrapped, I applied another coat of Mod Podge on top of the paper to seal it. Since I had so much paper left, I decided to make a sign too. I had this canvas in my supplies….I didn’t really care for the flower on it. I used one of the other canvases for my spring sign. The flower picture did not come off as easily as the other one I used in Spring, but I still went ahead and used it. 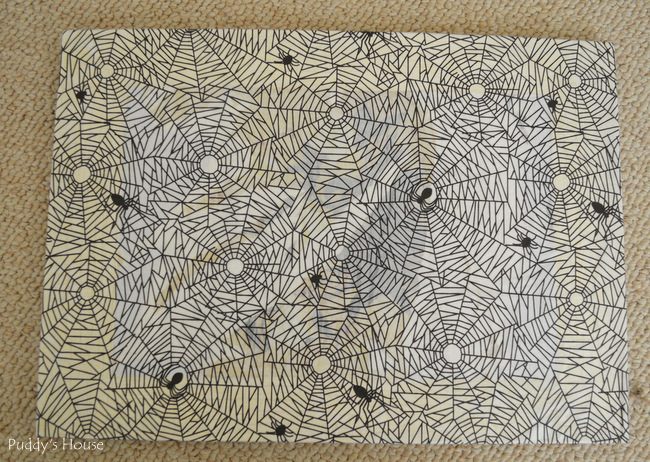 When I wrapped the spider web paper around the canvas, you could still see through it slightly. So, I decided to use a frame to match the existing frame on the canvas before. I went ahead and applied the decoupage paper with Mod Podge. You can slightly see through it in this picture. For the rest of my sign, I used my scrapbooking supplies. 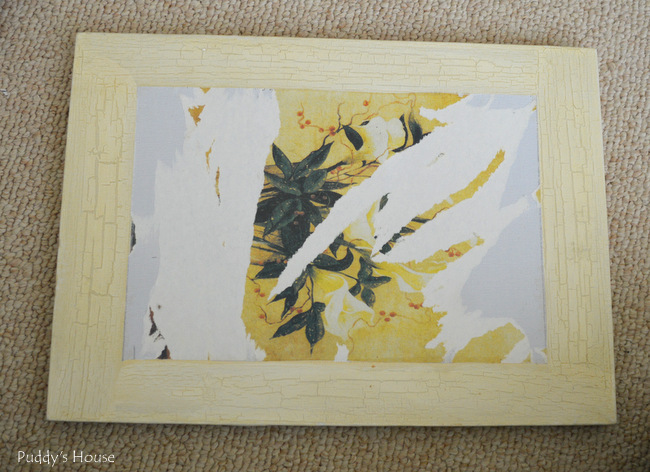 I cut a piece of white paper to make the background for the “framed image”. I also decided to outline that in orange strips to define the frame more. 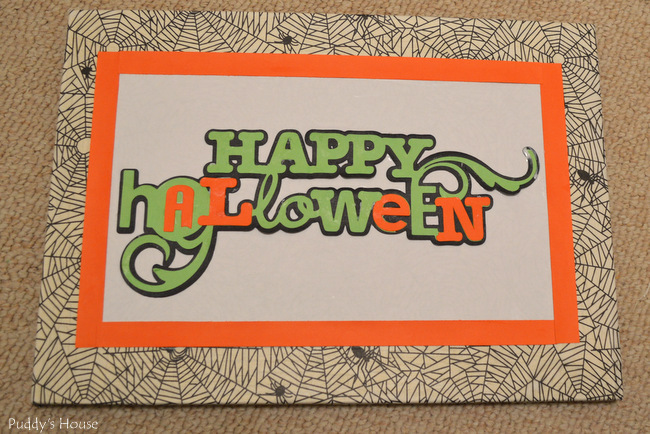 For my image, I decided to use my Celebrate with Flourish Cricut cartridge to cut out Happy Halloween. It was a 3 layer image, that I cut in 3 different colors. After I had all my layers attached with Mod Podge, I covered everything with another coat of Mod Podge. 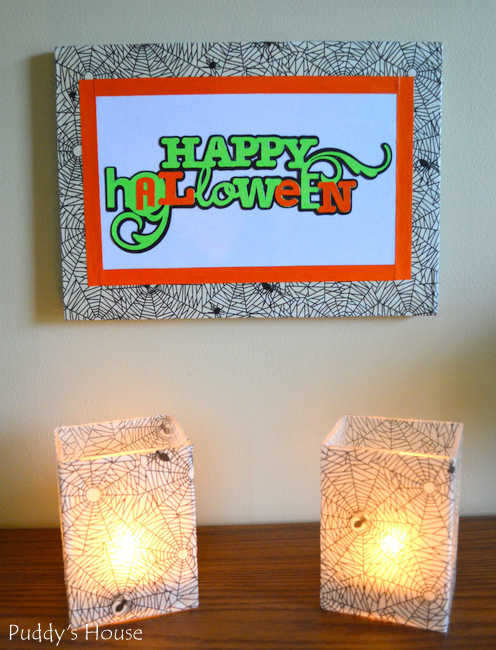 The canvas sign and vases make a cute little set to greet trick or treaters for Halloween. I especially like the vases used as candleholders. They glow so neatly in the darkness. 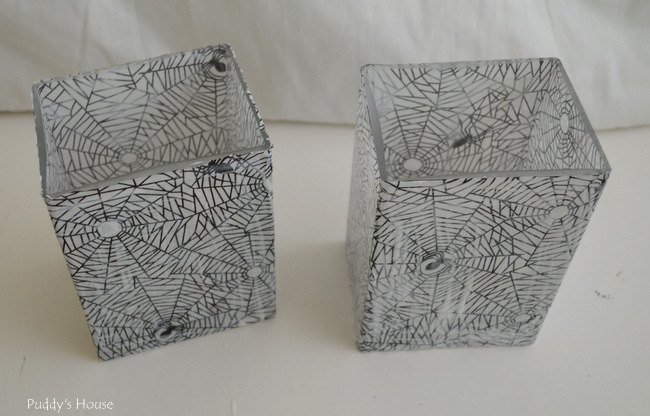 I have more sheets of the spider web decoupage paper left, what would you make with it? Would you use the gold or silver? This is such a cute idea! Love the candle holders and so easy! Thanks for sharing! Glad you like them! Yes the candleholders were so easy! It was great. So creative! 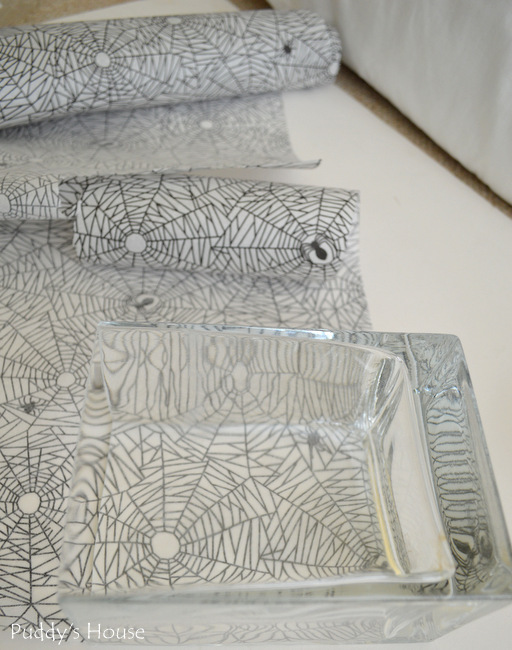 I love how you put together the spider web vases. Very happy to visit your blog as sharing you on FB Page of the Day. We both use PDC themes, too. And, I recently got a dog, Jack, who seems to run our home, too. I’ll Pin your project. Thanks!